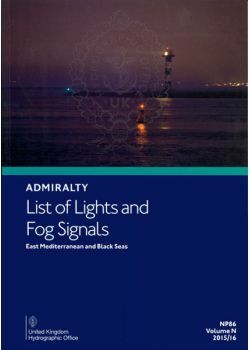 Admiralty List of Lights and Fog Signals 86 Volume N covers East Mediterranean and Black Seas. This publication provides extensive information on all lighthouses, lightships, lit floating marks (over 8m in height), fog signals and other lights of navigational significance. This publication also gives the characteristics of lights and fog signals, together with the equivalent foreign language light descriptions. Tables can be used to calculate the geographical and luminous ranges of lights. Details for all lights listed include the international number, location and/or name, geographical co-ordinates, characteristics and intensity, elevation in metres, range in sea miles and description of structure. 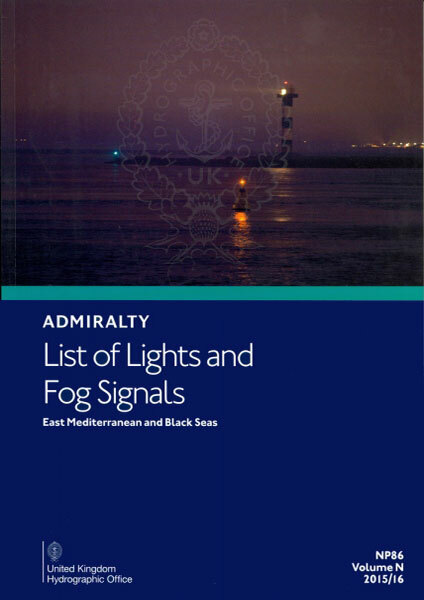 We publish new editions of the ADMIRALTY List of Lights and Fog Signals on a rolling cycle of revision. We also list important changes to lights in the weekly ADMIRALTY Notices to Mariners.